HANDS OFF SYRIA! HANDS OFF IRAN! 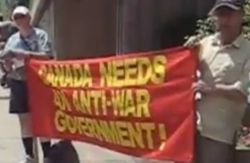 Organizer:Halifax Branch of the Communist Party of Canada (Marxist-Leninist), No Harbour For War, and others.